Paris, the City of Love and capital of France, is one of the most famous and visited cities on Earth. From the Seine River to the Louvre Museum, with the Eiffel Tower and Arc de Triomphe too, the city is home to a long list of monuments and landmarks. There are many different things to do in Paris that can't be done anywhere else in the world, from admiring the world-famous Mona Lisa to strolling down the incredible Champs Elysées. Another of the city's most iconic and legendary must-see monuments is undoubtedly Notre Dame Cathedral. 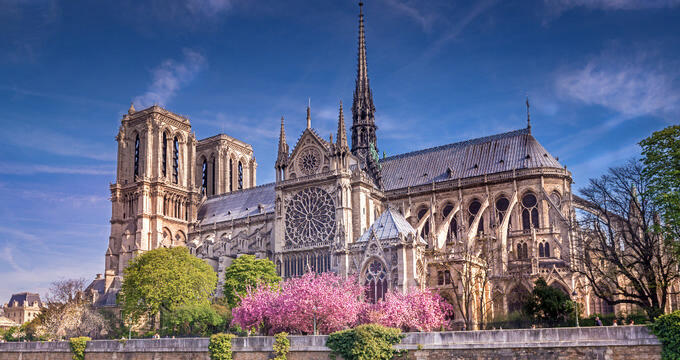 Also known as Notre Dame de Paris (which translates to 'Our Lady of Paris' in English), Notre Dame Cathedral is located in the city's fourth arrondissement and is widely regarded as one of the most beautiful cathedrals on Earth and one of the prettiest buildings in all of France. It’s one of the city’s must-visit locations, with various special events and ceremonies being held at the cathedral throughout the year. Notre Dame is one of the oldest buildings in Paris, with work on the cathedral beginning in the 12th century, in the year 1160 to be precise. Construction of the cathedral was mostly finished by 1260, but the cathedral has undergone various changes and enhancements over the years, as well as being damaged and having to be renovated and redeveloped multiple times. At the end of the 18th century, for example, during the French Revolution, Notre Dame Cathedral was ransacked by angry Parisians, with many of its religious relics being destroyed. Nevertheless, the building has remained standing for centuries and has been an iconic symbol of Paris and a very important cultural and historical location for the French people. Victor Hugo's story 'The Hunchback of Notre Dame', published in 1831, brought new life to the cathedral, leading to a major renovation project in the mid-19th century. Nowadays, Notre Dame Cathedral is one of the most popular monuments in Paris, with around 12 million people visiting from all around the world each year, which is actually a higher figure than the Eiffel Tower. If you'd like to visit Notre Dame Cathedral on your Paris vacation, there are multiple ways to access this iconic landmark. As one of the most-visited spots in all of Paris, it's very easy to get to Notre Dame via public transport. One of the best ways to get around Paris is through the city's subway or 'Metro' system, which has various routes running all around the capital and offering easy access to the major landmarks. For Notre Dame, the closest Metro stations are St Michel and Cité. City Hall and Châtelet are also relatively close to the cathedral. These stations are served by lines 1, 4, 7, 11, and 14. If you prefer to use the RER, lines B and C stop at the Saint-Michel station. Another option is to take the bus to Notre Dame Cathedral. Various lines, including the 21, 27, 47, 85, and 96, all stop off near Notre Dame at stops like Cité and Saint-Michel. Another way of getting to Notre Dame Cathedral is by taxi. Taxis can be found all around Paris and are the most expensive form of public transport, but are also one of the most reliable and convenient, able to drop you off right by the cathedral. If you're renting a car in the French capital, there are several parking lots in the Notre Dame area including Parking Notre-Dame, City Hall Parking, Parking Place St Michel, and Parking Lobau-Rivoli. All of these lots and garages are open round the clock, every day of the week, and provide easy access to the cathedral. If you plan on visiting Notre Dame Cathedral as part of your trip to Paris, there's some important information to be aware of. The cathedral is open every single day of the year. It opens up at 7.45 and closes at 18.45. At the weekends, the opening time is a little earlier at 7.15. Even on holidays and special occasions, Notre Dame Cathedral is open. Access is totally free to everyone, but you will have to pay to access certain areas and have tours of the towers and treasury. Due to the immense popularity of Notre Dame Cathedral and the large crowds that can build up here at all times of year, visitors should be prepared to have to wait around and walk slowly in time with other visitors. If you'd like to avoid the crowds, the best times to visit are early in the mornings or in the evenings before the cathedral closes down for the night. The cathedral is fully accessible to all, including those with reduced mobility, and audio tours are provided in multiple languages to help you learn more about the history of the building and its various features. Each day of the year, Notre Dame Cathedral also runs tours in various languages. The tours are fully free and cannot be reserved in advance, so you'll need to simply arrive at the designated time in order to enjoy this unique, educational experience. English tours are held on Monday, Tuesday, and Saturday at 14.30, as well as Wednesday, Thursday, and Friday at 14.00. Tours offer one of the best ways to experience Notre Dame, but all guests are encouraged to try to keep their voices down at all times to respect those who are visiting the cathedral for religious purposes.